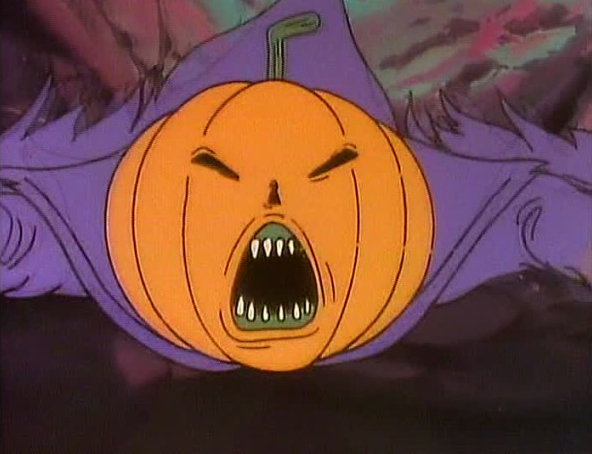 A new group of Ghostbusters is now in theaters, and while I am definitely looking forward to seeing the cinematic reboot, I still wish they could have featured the villain Samhain from the awesome Halloween-themed episodes of the animated series The Real Ghostbusters. In the first episode, “When Halloween Was Forever”, originally aired in 1986, when ancient ruins from Ireland arrive in New York for examination, the evil spirit of Samhain is released, who declares that Halloween should last forever and calls forth an army of the night. In the second episode, “Halloween II 1/2”, originally aired in 1987, as a Halloween party takes place in the Firehouse, two goblins sneak in unnoticed and release Samhain from the Containment Unit, and the spirit of Halloween immediately sets up his headquarters in the Firehouse and captures the Junior Ghostbusters. In the third episode, “The Halloween Door”, the Chairman of Citizens United Against Halloween, a man named Crowley, wishes to hire the Ghostbusters to assist him in his crusade. When they refuse, Crowley mistakenly opens up the Halloween Door and breaks the underworld’s ancient contract of imprisonment. The Ghostbusters must now battle Boogaloo and save the world. “The Halloween Door” was a prime time Halloween special that originally aired in prime time on ABC in 1988. It was later shown as a normal episode later in the season as a rerun, and it is also notable for its shout out to Donald Trump. You can watch all three of the classic Halloween episodes in the players below! For more Halloween news, follow @HalloweenDaily.